Cheryl Metrick and Jeree Wade, M.A. On the Wings of Inspiration calls to mind Julia Cameron’s The Artist’s Way in the way it prompts inner growth and self-reflection through creativity with inspiring images, poetry, prose, and exercises. It is an innovative, spiritually oriented, self-help book that offers combined techniques, from Jungian and cognitive therapies to meditation and creative play. Singer and actress Cheryl Metrick was meditating regularly when the spontaneous symbolic images and poetry included in the book “just fell out of my head.” Friend, therapist, and fellow singer, Jeree Wade, found Metrick’s images powerful in her own work, and the two collaborated on this book. Metrick opens each chapter with an image and poem. She follows these with an autobiographical meditation that reflects on both and concludes with an affirmation. Wade then finishes each chapter with her own inspirational narrative on Metrick’s images and words and offers creative exercises, from asking readers to contemplate key questions on that chapter’s theme to offering drawing and visualization exercises. The authors’ voices dynamically cover broad universal themes, including the power of love, passion, and the act of letting go. Each chapter can stand alone, allowing readers to pace the journey as they like. On the Wings of Inspiration is a stimulating read. Its images and poetry are unique, evocative, and beautiful, and its narratives and exercises are cathartic, often fun, and effective. The balance between two authors brings accessibility to this guide to creativity and spiritual growth. This inspirational workbook provides a model for using creative expression as a tool for personal and spiritual growth. The authors of On the Wings of Inspiration succeed in offering a readable and congenial template for self-exploration through creativity. The authors balance each other well. Cheryl Metrick’s intuitive drawings, poems, personal essays, and affirmations show how a sensitive person can tap into her own world of symbols and use them to enhance self-understanding. Jeree Wade’s contribution to the book extends the process from the personal to the universal through her understanding of Jungian psychology and its teachings on the power and universality of symbols, archetypes, and the collective unconscious. Her thoughtful commentaries, contemplative questions, and workbook exercises help the reader see how dreams and fantasies partake in a universal human symbology that spans time and cultures to link the conscious and unconscious realms. Overall, the deep respect and admiration between the two authors brings an element of sweetness and light to their collaboration; their book will provide a comforting and encouraging space for readers who may be in crisis or are embarking on their first explorations into their inner world and seeking wise companionship for the journey. Singer/songwriter Cheryl Metrick has such a lovely voice that comes out sounding simply heavenly. Our Webzine recently spoke to Metrick about her music. She revealed many wonderful things in this special spotlight. Here is what transpired. ISAAC: Let’s get started with this interview. When and how did you first become interested in music? How long have you been playing music? --- CHERYL: My interest in singing started in elementary school. I knew from a very early age that I wanted to become a singer because I enjoyed singing and I always received positive feedback from my teachers and my audiences, small as they were back then. I sang in school chorus, school plays and church choir and then started private voice lessons as soon as I was able to afford them, at 16 years of age. I continue to work with a voice coach today, at least a zillion years later. I wish I could say I play a musical instrument, other than voice, but I don't. I've taken a little piano, a little guitar and when I was a child I took violin. But I am not accomplished at either, strictly for lack of time, not interest. I want so much to go back to piano and guitar and would also love to learn to play the harp someday, not to mention the Native American flute. I just wish I had 40 hour days. I am a SAG/AFTRA actress who has worked professionally for the past 25 years in theatre, television, and film. I also entertained at many of the New York Catskill Mountain Resort Hotels and performed in clubs, charitable events, and industrials in NYC and the tri-state area. ISAAC: Who would you say are your biggest musical influences and why? --- CHERYL: Judy Garland, Frank Sinatra, Nat King Cole, Edith Piaf, Barbra Streisand, Ella Fitzgerald, Peggy Lee, K.D. Lang, Willy Nelson, Johnny Cash: because of their phrasing. They are/were all impeccable at turning a phrase. Not only could you hear each and every word, but you really understand their messages when you listen to their work. ISAAC: What has been the greatest disappointment in your career so far? What did you learn from that experience? --- CHERYL: I had a leading role in an off-off Broadway show and had put a lot of work (3 years worth) into the production of it, only to have the entire production collapse just as the it was about to be mounted. Everyone on the team was disappointed, but that's Showbiz. My lesson? Although a lot of time and effort went into the project, and it unfortunately didn't work out, I still meet some terrific people and got some good experience and made contacts. So I am also a bit of a fatalist, and feel it just wasn't meant to be at that time. Maybe sometime in the future. ISAAC: What draws you to want to play the type of music that you do? --- CHERYL: I like to write and/or sing music with a positive message, and touch the hearts and minds of my audience to uplift them, as best I can. Of course, sometimes I also may want to draw attention to something when I feel there is necessity. That’s a different kind of message song. ISAAC: What do you feel it takes to play this type of music that you play? ---CHERYL: Honesty and openness to something bigger than oneself. ISAAC: If you had the opportunity to do one cover, what cover would you do and why? How would you put your own spin on this cover? --- CHERYL: I think Rogers & Hammerstein's "You've Got to Be Carefully Taught" from South Pacific. I have always loved the message of this song which talks of how people are NOT born with prejudice but are taught it - some teachings are NOT good. My own spin would be how I would use my own phrasing, as I do with every song I sing. I sing every word from my heart. If I don't mean it, I don't sing it. ISAAC: What does it take to be a good songwriter? --- CHERYL: Silence within ...to listen to your inner voice, then get ready and let it flow. At least that's how it works with me. I think it's different for each person. ISAAC: How difficult is it to juggle music, family and work obligation, and life in general? Explain. --- CHERYL: The word DIFFICULT...can't even begin to explain it. It is so tough, but when you love music, you have no choice. It is part of you, a part you can't say “no” to. You find a way to squeeze it in. But it ain't easy. ISAAC: What is your definition of being an Indie artist/band? --- CHERYL: Dedication to your music in spite of possible lack of financial remuneration, or at least enough of it. You do it because you love it and you feel compelled that this is what you are meant to do. Not to mention the endless self-promotion. Most importantly though, you are your own boss. You create your art the way you see it and hear it. You own it and that's a great feeling. ISAAC: In five years……. 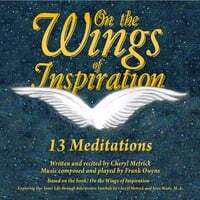 --- CHERYL: I am currently in the middle of collaborating on a book called “On the Wings of Inspiration” that is based on 13 of my drawings and poems and it will be published by this fall. Plus, I have written a short animated film which is for my song “There Are Angels” which I am going to produce probably by the end of this year or early next year. I also have a children’s story that I intend to write soon, and I’ve been writing more songs lately, and will probably record a full album of my own material sometime next year. But my word... five years from now? I just hope to be writing, and producing, and with luck... people will like my product. All I know is that I put my heart and soul into my work, so I do know at least that I like it. LLOYD HARBOR, NY, May 7, 2010 /Cambridge Who's Who/ --Cheryl Metrick, Actress, Singer, Songwriter, Artist, Poet and Author, has been recognized by Cambridge Who's Who for demonstrating dedication, leadership and excellence in performing arts. A veteran performer, Cheryl Metrick has enjoyed a 25-year career as a professional singer, recording artist, and actress. Known for her ability to sing in various genres from pop, jazz and classic rock to musical theater and cabaret, she has entertained audiences in resort hotels across the Catskill Mountains and in numerous cabaret/jazz clubs and at charity events. She previously released a CD, "Cheryl Metrick Fantasy & Romance," and recently composed and recorded "There Are Angels," a song in which she performs with a string orchestra to an arrangement by her music director and arranger Frank Owens. A singer from the age of 16, Ms. Metrick considers being able to make a living out of her life's passion to be the most gratifying aspect of her career. She attributes her success to her husband, who always encouraged her to follow her heart. Equally adept at television, radio, film and theater work, Ms. Metrick has lent her talents to various community theater productions, independent films, and commercials. She co-stars in "Hit or Miss Variety Show," a Long Island public access TV show that airs on Cablevision channel 20 every Sunday and Tuesday, and in a serio-comedy TV pilot called "High Hopes," whose trailer can be seen on YouTube. Ms. Metrick is a member of the Screen Actors Guild, the American Federation of Television & Radio Artists, the Society of Singers, Inc., the Long Island Film/TV Foundation, and Filmmakers Connection. As she moves forward in her career, she hopes to record more songs and increase her involvement in song writing. She is presently collaborating on a book with Jeree Wade, M.A., a life coach and fellow singer. The book, titled "On the Wings of Inspiration," is based on a collection of Cheryl's drawings and poems. The premise of the book is exploring your inner life through interpretive symbols and it will be published by Xlibris. Cheryl also has a Facebook page called CHERYL METRICK: THERE ARE ANGELS, which she designed to promote her CD, "There Are Angels" as well as encourage conversation about angels in general. It now has a worldwide fan base. Cheryl Metrick's recordings are available for hard copy sale and/or downloading at her website, http://www.cherylmetrick.com, as well as on iTunes, Cdbaby.com and Amazon.com. Cambridge Who's Who Press Release - Cheryl Metrick, Actress, Singer, Author, Artist has been recognized by Cambridge Who's Who for demonstrating dedication, leadership and excellence in the performing arts. With 25 years of experience as an actress and singer, Ms. Metrick specializes in acting and singing (pop, jazz, musical theatre, classic rock and cabaret styles.) She also writes music and poetry and is in the middle of collaborating on a book with Jeree Wade (a life coach & counselor plus fellow singer) titled "On the Wings of Inspiration" based on 13 of Cheryl's drawings and 13 of her poems all of a spiritual nature. The book will be released in 2010. Cheryl has performed in many resort hotels, cabaret clubs, community theaters, at charity events, on the radio, on television and in independent films. She has a CD currently on the market called "Cheryl Metrick Fantasy & Romance" and also has a new single CD about to be released later this year titled "There Are Angels" for which she wrote both words and music. Her music director/arranger, Frank Owens, wrote a gorgeous arrangement for the song and they used a live string orchestra which sounds absolutely beautiful. She costars in a public access television show called "Hit or Miss Variety Show" that airs every Sunday (trailer can be seen on youtube.) She costars on a new TV pilot called "High Hopes" (trailer can also be viewed on youtube.) As a child, she enjoyed the performing arts and singing. She began taking singing lessons at the age of 16 as soon as she could earn enough to pay for the lessons. She attributes her success to her persistence, to a close group of acting friends who all struggled together to make it in this crazy business, and mostly the emotional support of her husband who encouraged her to follow her heart. Ms. Metrick completed coursework in accounting, acting, voice, spirituality, and various metaphysical courses/seminars and wishes to continue on a path of perpetual learning. She is a member of Screen Actors Guild; American Federation of Television & Radio Artists; Society of Singers; Long Island Film/TV Foundation: Filmmakers Connection and Guild of Italian American Actors. Reviewer: CAROL PRIANTI - I have heard Cheryl Metrick sing in person and she is just as incredible on this CD. These classic favorites get brought to a new level with Cheryl's dreamy voice. This is the CD I listen to after a long day of work to relax. Can't wait for another!! Reviewer: LISA SUCHY - Wow. What can I say about but Wow again! Cheryl's voice is beautiful. Magnifico! Reviewer: FRANCES G - A wonderful nostalgic journey from a beautiful singer. Reviewer: SEVI REGIS - A delightful compilation of meaningful songs performed with fluidity, frolic, gusto, and tender sentiment. I recommend it for driving, easy listening, romantic moments, beach sitting, background party music, and hey, why not doctor's offices? This way you can feel good while you don't feel good. Brilliant, A rainbow of talent. A beautiful singer with soul. Reviewer: TERRY HAPP - Brilliant, Cheryl Metrick is a rainbow of talent. She is a vision to behold. Her talents are extentive and she remains true to herself. A pure soul with a voice of gold. Wonderful selection of songs. Artist first rate! Reviewer: SUSAN KAPLAN - Cheryl chose songs for the album that I would have chosen, myself. Her voice is wonderful. I'd never heard her sing before. I look forward to more CDs. A Special Talent with a Pure Soul, April 4, 2007 Reviewer: TERRY HAPP (New York , USA) Cheryl Metrick captivates her audience..She grabs hold of them with her sweet and powerful performance.She is a beautiful woman who sings like an angel.She will take you to a different time and place with her array of songs. She is a gem that shines in this day and age. Pure talent that is fun to listen to. We love Cheryl Metick and can`t wait for her new CD. Try to catch her live performances if you can. A treasure of the music industry. Refreshing musical dream, April 3, 2007 Reviewer: A. STAMPFEL "movie lady" (New York) - Every once in awhile along comes original talent. Cheryl Metricks new and dreamy music takes you away on a true fantasy. Keep them coming lady! Classic romance for a modern world, April 2, 2007 Reviewer: SOLON TSANGARAS "The Bass Dude" (New Yawk) I picked up this disc a while ago, and when I tell you it puts me in a mellow zone would be an understatement. The voice and music blend beautifully, creating a smokey atmosphere that only a true live performance can give. Cheryl's aura transcends the boundaries of a c.d., it feels as if she's actually right there performing for you personally. A must-have for any fan of this genre! Amazing Voice; Classic & fun songs, April 1, 2007 Reviewer: JACQUELINE M. FOSKETT "Healing Hypnotherapy" (Seattle, WA) Love the classics? Love a great voice? Then this is the cd for you! Cheryl is a true professional as she takes us on a journey of nostalgia with the songs she has choosen and her dynamic voice. What a joy it is to listen to her sing! A BEAUTY SINGS THE STANDARDS, April 1, 2007 Reviewer: JEREE WADE "LADY LIFE COACH" (NEW JERSERY) Cheryl Metrick knows her music. For those of us seasoned listeners...we are overjoyed to hear a singer sing the correct melody and lyrics while at the same time adding her individual style. With the class of a Shirley Bassey, Cheryl sings with joy and sincerity in her lovely voice... and you know this is a singer who understands the musical nuances and the message of a song. Along with the extraordinary Frank Owens, her arranger and musical director, this CD is a keeper. I look forward to Cheryl taking the stage again soon because I know she will take her performance and music to a new plateau, one in which we do not hear enough of in this day and time. She has many fans and I am one of her biggest and we are all waiting for the next live performance and new CD. Hope this is only the beginning for this talented beauty!! !, April 1, 2007 Reviewer: SHEILA JORDAN MIXON (Long Island, NY) Cheryl Metrick! Wow!! I've seen her perform many times, and she is not only a beauty, but she is an extremely talented, and gifted performer. She gives her all to her performance, and with her varied repertoire there's something for everyone in this CD. I've listened to it over, and over, and it never ceases to entertain; I can't wait for her next CD!! Local Comedy Spoof Centers On Long Island by Swati Bindra June 01, 2005 LOCAL FILM—(pictured left to right) JUDY PRIANTI, JIM MAURO and CHERYL METRICK were all cast in “Austin’s Angels,” a comedy spoof that was mainly filmed on Long Island. Photo by Thomas Pesce “Austin’s Angels,” a spoof on “Charlie’s Angels,” “Austin Powers” and “The First Wives Club,” was filmed on Long Island with a substantial local cast. The movie is set for release in July. Shot throughout Long Island, “Austin’s Angels” tells the story of three wives who believe their husbands, real estate moguls, are cheating on them with three women, considered the “angels” in the movie. Sal Rinella, 41, the film’s director, producer, writer and star of the show, said the process was great. “It was so nice,” he said, “taking this process from the script, to finding the people ... to the filming. “The locations are fantastic,” Rinella said. The film takes viewers through Northport; Lloyds Neck, Huntington; East Quogue and Franklin Square, among other locations on Long Island. The movie also took place in parts of New Jersey, City Island and Staten Island. Filming for “Austin’s Angels” began in September and wrapped up in April. “There are so many look-alikes in this film,” said Rinella, who played Austin Pacino, the private investigator hired to find out if the wives’ husbands were cheating. After the character Pacino is hired, Rinella said, that is when “all the misadventures begin.” “It was a wacky film,” said CHERYL METRICK, who played an auctioneer during one of the scenes. “Everybody seemed to have a lot of fun.” A native of Long Island, the art auction scene was shot at Metrick’s estate in Lloyds Neck. Metrick has been acting for more than 20 years. JUDY PRIANTI, another native of Long Island who has been acting for 18 years, played one of the wives in the movie and said everybody on set was “wonderful and easy to get along with,” adding that she loves comedic roles. Rinella’s comedy has been influenced by older comedians, such as Abott and Costello, Laurel and Hardy and the Marx Brothers. Newer comedians have also influenced him, including Mike Myers, Ben Stiller and Eddie Murphy. CHERYL METRICK made her New York cabaret debut at Eighty Eight's for a one-night engagement, and from the way she took command of that stage you would swear she'd been here before. Whether it be Rodgers and Hart's "Where or When" in a slow waltz, or the pairing of "Somewhere" with "Somewhere Out There", everything was right in place and her body language, connecting with the audience, was first-rate. Her material was a mixture; Nat King Cole’s “Unforgettable” and “Nature Boy” waxed Metrick nostalgic, while “Smile” written by Charlie Chaplin was inspirational. Not to mention the beautiful “Rainbow Medley” with “Over the Rainbow”, “Rainbow Connection”, “Look to the Rainbow”, and “I’m Always Chasing Rainbows”. She was just as at home with the hilarious “Beethoven Chased by Rossini”, with lyrics by Garrison Keillor, sung as if she were a cat. She was in great company on the stage with FRANK OWENS on piano, CONRAD ADDERLY on bass, and PETER GRANT on drums. No doubt that she’ll be back - watch for CHERYL METRICK! ...IAJ has kept up with changing times. And reflect on those times they did, at a celebration at Five Towns College in Dix Hills that was punctuated by Jazz offerings by no less than pianist FRANK OWENS, horn player DAVID RANDALL, saxophonist TALIB KIBWE and vocalist CHERYL METRICK...Ms. Metrick, a Walt Whitman High School product and nationally touring talent, swung easily into a jazz groove as an appreciative audience of IAJ well-wishers listened.